Practice seven specific problem solving skills in isolation. 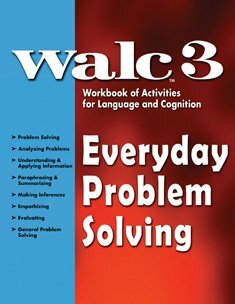 Then, apply them to depicted situations and generate and evaluate solutions.Focus on the cognitive processes and strategies used in problem solving. Hundreds of problem scenarios are presented based on common themes of money, work, family and social relationships, health and safety, and sports and leisure. Multiple-choice and open-ended questions guide clients to practice the targeted skills. Problem Solving - Identify a problem statement based on a brief scenario. Generate a quick solution based on limited information. Understanding & Applying Information - Identify information that is useful for problem-solving and apply it to depicted situations. If you have any questions about this product by LinguiSystems, contact us by completing and submitting the form below. If you are looking for a specif part number, please include it with your message.